The research outlined in this journal provides an international perspective on the important components for innovation. It looks at the role that people play in the innovation process and expands on the thinking around the role of leaders, teams and organisational culture. The combination of individual team and organisation reinforces the importance of OE Cam’s partnership approach where we work closely with businesses to refocus the direction and to make new possibilities a reality. Innovation cannot be seen in isolation. Ultimately it is about enhancing organisation effectiveness. 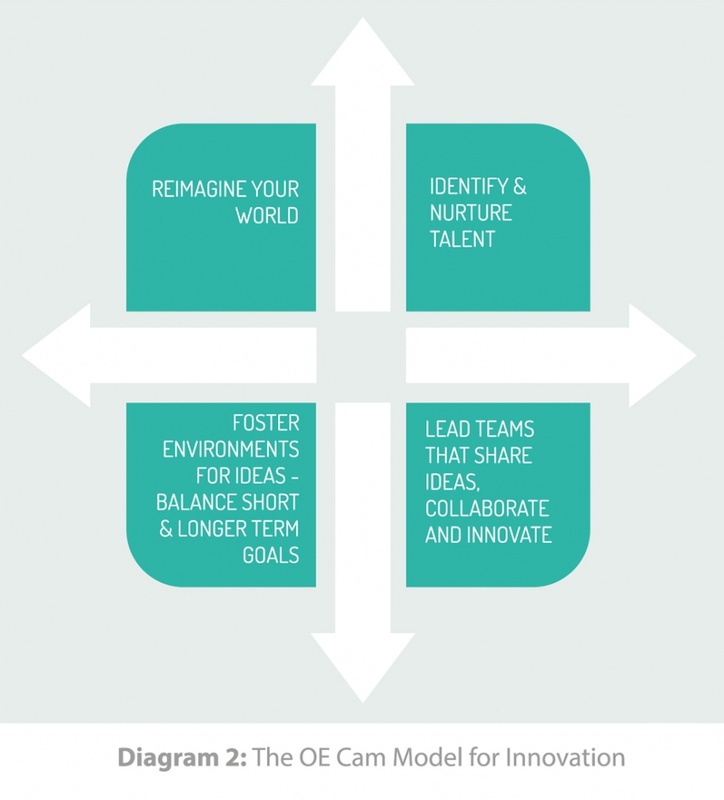 In this article, we explore the OE Cam model for innovation and outline how we work with businesses to enhance the innovation process. We facilitate our clients to think differently; to reimagine the possibilities, to change mind-sets, embrace tensions and create the right ecology in which ideas can flourish. At OE Cam, we define innovation as “the creation of a new order of things; innovation is making a new product, service or technology work. It starts with creativity through research and development, to market research, experimentation, manufacturing through to marketing and sales. It is the adoption of the idea that distinguishes innovation from creativity and disruption. Both creativity and disruption are necessary but not sufficient. An innovation changes a part of the world”. Businesses need the opportunity to see new possibilities and reimagine the way to do business. Ideas alone are not enough and innovation cannot be an end in itself: there has to be a financial return and all the right processes and talent in place to translate good ideas into commercial reality. For many organisations the focus is on incremental change and performance improvement. However the commercial world moves at such a pace that it is all too easy to lose the premier spot. Most taxi firms perceived their competitors simply as other taxi firms and certainly did not envisage the advent of Uber. Blockbuster became obsolete as the technology changed rapidly and new streaming models such as Netflix and Amazon came to prominence. Zip Car provided a flexible way to hire cars by the hour rather than using the traditional rental approach. At OE Cam we explore with organisations how to make full use of the innovation paradigm outlined in Diagram 1 below. Our focus is less on the 1D-2D ‘incremental’ side and more on 3D and 4D or ‘breakthrough’ innovation. We enable businesses to reimagine their world and seek out possibilities that are not immediately obvious. This is where the power of the chaotic and complex comes into play – incremental improvements are fine but game-changing innovation only occurs when people operate in 3D or 4D. It is in these paradigms that the environment, people and ideas combine to radically move the organisation forward. Innovation can be seen holistically, it touches every part of the business so if organisations are to introduce more ‘4D’, there is a need to think through the potential implications for 1D. We begin by supporting organisations to define their dominant logic and how they fit in the context of their market. A good starting point is to create a high-level entity map that plots the moving parts of an organisation across a range of dimensions. We can then project different ways of working. We know that not evolving your business model can lead to catastrophic consequences… Success comes from being agile and responsive. So Apple iPhones go from strength to strength whilst Blackberry recently announced that it would no longer produce phones. Innovation is no longer a ‘nice to have’ – it is a business imperative. In bringing about an innovation-oriented culture, our research underlines the importance of taking on-board the potential gap between existing values, assumptions and beliefs, and those of the new paradigm (the new mind-set). As one German director of an energy provider discovered: “It is important to anticipate conflicts with traditional business. People need to see the additional value that innovation brings, otherwise there is no acceptance”. 1 In innovation, the cultural conflict is not always between the ‘old’ and the ‘new’. In general, for every 100 ideas only 5-10% of them will come to fruition. An ‘innovation funnel’ helps filter ideas and pick those with greatest chance of commercial success – some ideas are more likely to work in one environment rather than another. There needs to be a balance between divergent and convergent thinking for ideas to grow. Once they have been initially scoped, they need room to develop before practical business implementation. The people who generate ideas are often different from those who implement them. They have different capabilities and strengths and it is rare to get someone who embodies both sets of characteristics. For example, OE Cam has worked for the last few years with AB Agri to enhance innovation through the development of its New Ventures programme. We worked with them to identify the right people and select the best teams for innovation. This has resulted in new business streams and opportunities for technological and revenue growth. The focus is on world-class science and technical excellence coupled with innovation. The approach combines commercial capability with depth of understanding and the tenacity to succeed. People are encouraged to be agile; to adapt and be flexible. The focus is on breadth of thinking, taking a big picture view and developing group level thinking. There is a strong drive for growth coupled with a focus on excellence and collective ambition. By being agile, the business can prioritise capability and enhance overall effectiveness. To put into perspective how to enhance innovation we have illustrated our approach in the model below. The first step is to reimagine your world and rethink the overall business context. Who are the competitors? What has changed in the marketplace? What technologies, processes, potential competitors are emerging? We support you to think out of the box to learn and to adapt to changing market conditions. Secondly, OE Cam enables you and your people to create a mind-set for growth. Capture and celebrate diversity; look out for talent that is somewhat different in the way that they think and behave. Embrace the competitive tension within your business and use them to advantage. Expand the scope and breadth of thinking for teams. Build on the collective energy and let that develop so that you enhance the momentum and pace. It is important to create incentives for sharing and to celebrate success and learn from failures. This is an ongoing process – so keep up the pace and the momentum! The ‘Creatives’ create the vision and generate ideas. They handle ambiguity well and are driven to succeed. The ‘Change Deliverers’ are collaborative and results focused. They combine their social skills with their ability to think systematically and to drive the agenda forward. They are agents of change. No less important for the quality of ideas are the ‘Smart Creatives’ who use their intellect and critical evaluation skills to challenge and to rethink ideas. A critical factor for success is to identify and develop disruptive talent. We define these people are “individuals who think and act differently, who innovate, who challenge conventional wisdom, and practice, spot trends, see commercial opportunities, and tenaciously find new and better ways to deliver business success”. They are highly focused, manage ambiguity, are curious about where this may lead, and are keen to create and operationalise solutions where others have feared to go. OE Cam not only objectively identifies the disruptive talent within businesses but also supports the integration process. All too frequently disruptive talent is difficult to manage and needs to be nurtured. To find out more about disruptive talent read the journal specifically dedicated to this topic. According to our research, a relatively new role in the innovation landscape is that of ‘Innovation Architect’ (IA). IA’s have an open-minded vision, surround themselves with reliable partners, see the big picture and empower intrapreneurs. We believe they can play a vital role in removing some of the internal barriers to innovation. In our journal on ‘The Ambi-dextrous Organisation’ we explored the complexity of factors in driving change and innovation whilst keeping up with the day-to-day demands of business delivery. It is often challenging to get the balance right and to create the right ‘ecology’ for innovation whilst maintaining the success of the current. This involves managing competing tensions and ensuring the right priorities. The research highlights the importance of teams who collaborate and who energise each other to deliver new and outstanding solutions. The leadership cadre needs to support the innovation process and encourage ideas whilst keeping a watchful eye on day-to-day delivery of profit for the organisation. This involves a different mind-set and development of excellent leadership capabilities. The summary report highlights the six DNA ‘building blocks’ that leaders need to influence. It is far easier for leaders to kill off ideas, to stick with what’s proven and avoid taking risk… Our research shows that for innovation to occur, leaders need to let go of this natural tendency towards order and control and accept more of a ‘chaos management’ model. OE Cam business psychologists work closely with business leaders to enhance their approach as leaders of change and help them develop the mind-set for growth. Focus on celebrating diversity! Innovation programmes benefit from bringing together diverse sets of individuals. Disruptive Talent may be the stars in your innovation programme, but they need the support of a balanced mix of individuals each bringing a different set of competencies and expertise to the project. But with diversity comes tension… remember that a fundamental part of the innovation process is ‘creative abrasion’ where ideas are productively challenged. More often than not we are called in to help individuals in teams who are not ‘getting along’. However, the most effective teams learn how to use this tension to create stronger solutions. Each level enables a focus on the factors that make a critical impact on how ideas are successfully (or not) implemented within the organisation. To get the most out of the innovation process, it is not enough to employ the right people and encourage them to generate ideas. This is part of the story but not the whole journey. There is a need to take a holistic approach to address the areas of organisational culture, environment and team, leaders and the individuals. There are numerous trade-offs to navigate, how local or global will your initiatives be? Are you looking for top down direction or emergent ideas? How much guidance versus support will be there? How much facilitation versus direction should there be? Challenge conventional thinking, allow people the opportunity to explore and to share ideas. By creating an environment that fosters ideas and ‘outside of the box’ solutions, people can flourish and grow. Think carefully about how to organise resources. Ensure that there are leaders who are there to support change and innovation. Get the balance right between short-term profitability, which must be maintained and the longer-term ideas generation. Build it into the very fabric of the organisation. Dream – reimagine – and make it happen! Download the New OE Cam journal ‘Human DNA in Innovation’. Can you modify organisational DNA to become more innovative?